Do you manage patients with gastrointestinal cancer? Do you need a rapid reference handbook to guide you through your diagnosis and management options? If so, then Handbook of Gastrointestinal Cancer is the book for you, providing clear, practical guidance to the diagnosis and clinical management of all forms of GI cancer, in a highly accessible format. Perfect for GI/Oncology trainees and junior gastroenterologists/oncologists and designed for point-of-care consultation, each chapter is structured in a uniform way and contains a variety of handy text features to help the reader such as case histories, key practice points, key weblinks and potential pitfalls The authors emphasize the best clinical assessment and management methods of patients and dedicate an entire chapter to each cancer, from esophageal to lower GI, and from biliary to pancreatic cancer. 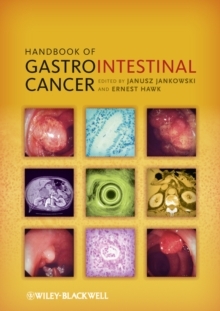 This attractive new book features: * Comprehensive yet quick and easy display of key points * Case studies to illustrate cardinal lessons or dilemmas * A fully integrated GI/oncologic approach * An outstanding and international editor and author team of great experience * Illustrations of key clinical or investigative features Handbook of Gastrointestinal Cancer answers all your clinical needs and is a must-have tool on the ward for all trainee and junior gastroenterologists and oncologists. "Handbook of GI Cancer ...does an excellent job of indicating which clinical recommendations are solidly evidence-based, and highlighting those that would benefit from further research." Monica M.
Bertagnolli, MD, Chief, Division of Surgical Oncology, Dana Farber/Brigham and Women's Cancer Center, Boston, USA "Handbook of Gastrointestinal Cancer is a comprehensive text that should be on the bookshelf of every physician and surgeon who deals with GI malignancies. The editors, who are internationally renowned, have assembled an all-star cast of contributing authors from around the world. The inclusion of key points and case studies, and the use of an evidence-based approach, make this a stand-out reference." Mark K.